The vertical drop from summit to base is 1804 ft. The average difference in altitude between base and summit of Ski Resorts in France is 2848 ft. The highest point of the track is 7874 ft above sea level. Gavarnie Gedre is among the 10 best rated Ski Resorts in the Pyrenees. It is among the 10 most family-friendly ski Resorts in the Pyrenees. Season starts on Dec 22 and ends on Mar 17 (85 days). Average season duration in France is 118 days. Gavarnie Gedre features 52 sunny days on average per season. The average for all ski Resorts in France is 49 sunny days. February is the sunniest month with an average of 21 sunny days. This makes the ski resort one of the 10 sunniest in the Pyrenees. Offering 28 miles of slopes and terrain, Gavarnie Gedre is among the 10 largest Ski Resorts in the Pyrenees. Situated in the Parc National des Pyrenees the villages of Gavarnie and Gedre await you. The extraordinary surroundings of the skiing area have been declared a World Heritage Site by UNESCO and invite you and your family to enjoy a diverse and relaxing winter holiday. 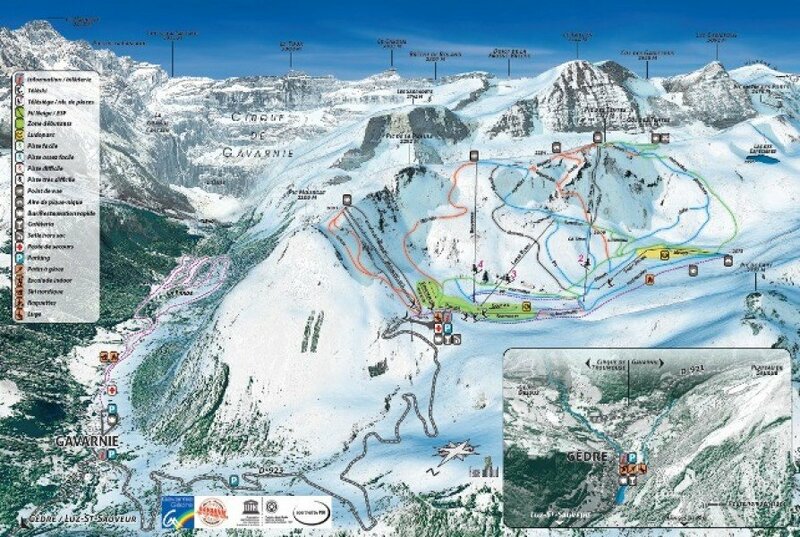 The ski area Gavarnie-Gedre with its 29 slopes is within easy access and offers beginners to experts a special skiing adventure. 11 different lifts will ensure a fast and safe ascent to your trail of choice. Of special interest to beginners might be the green trail of 7,5km length which is regarded as one of the longest beginner slopes within the Pyrenees. Besides its well groomed trails the ski area of Gavarnie-Gedre includes a childpark that will guarantee a fun and interactive holiday for your children. The local ski school offers courses for everyone and welcomes you warmly to enjoy a pleasant stay at Gavarnie-Gedre.